This entry was posted on March 23, 2018 by Chris Elliott. Engineered hardwood flooring is made up of multiple layers of wood. The surface of the flooring plank is called a wear layer. This is the part that you can see once the floor has been fitted. The wear layer is your chosen species of wood. For example, Oak or Walnut, and is usually between 2.5mm – 6mm in thickness. The rest of the plank of flooring is made up of base layers. This gives additional strength and stability to the flooring. So, for example, the total thickness of your flooring plank may be 18mm but only 4mm of that may be real hardwood and the other 14mm will be the base layers. There are usually multiple base layers made from either plywood, Hevea or Eucalyptus which are fixed to the wear layer at a 90 degree angle to give dimensional stability to the flooring plank. Engineered hardwood can either have a click fitting system or a tongue and groove profile, and can also be found in parquet blocks. Plank widths, thicknesses and lengths can vary depending on your requirements. There are also different finishes to choose from including: oiled, lacquered, brushed and unfinished. If you choose an unfinished floor, then you will need to protect it with an oil or lacquer once it has been installed. 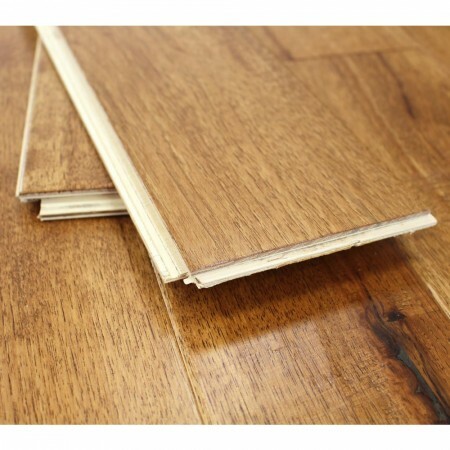 Engineered hardwood flooring should not be mistaken for laminate flooring. Engineered hardwood actually has a top layer of real hardwood, whereas laminate flooring is a high quality picture of wooden flooring laminated onto high density fibreboard (HDF), not wood. 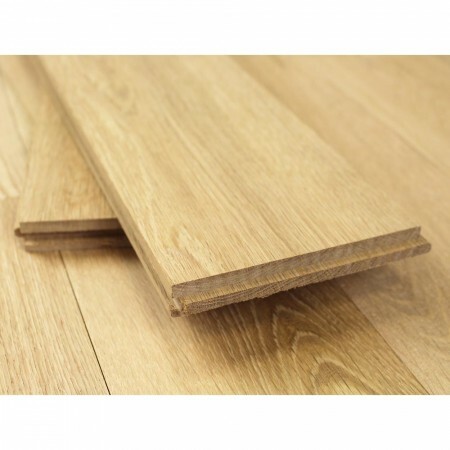 For more information have a look at: What is engineered wood flooring? What are the advantages of engineered hardwood flooring? You will usually find it more cost effective than solid hardwood flooring. It is difficult for you to tell it apart from solid hardwood flooring once installed. It has a real layer of hardwood on top. You will be able to use it in more versatile ways as it is more resilient to changes in temperature and humidity than solid wood flooring. It is a very stable product and can be installed in over an underlay and with underfloor heating and in conservatories. It can also be fixed to the subfloor if required. If you choose a click system engineered hardwood then you will find it quick and easy to install. You will have a choice of different wood species, styles, colours, finishes and plank sizes. If necessary, you can sand the top layer of real wood and refinish the flooring. Solid hardwood flooring is simply made from a solid piece of hardwood. The wood is cut straight from the tree trunk, then made into a plank of flooring by a machine. You will be able to find solid wood flooring with different species of wood, varying plank sizes and a choice of finish. Alternatively you could opt for unfinished solid wood flooring. This gives you the chance to install your hardwood floor first and then match a colour stain and style of finish to you décor. Solid hardwood flooring is popular and widely desired as it is thought to create a luxurious appeal to your home. The majority of solid wood flooring comes with the more traditional tongue and groove fitting profile, although you can find solid wood parquet blocks and occasionally click fitting planks. Solid wood flooring need to be fixed into position during installation. It cannot be floated over an underlay as it needs the stability of being securely fixed to the subfloor. For more information have a look at: What is solid wood flooring? What are the advantages of solid hardwood flooring? It is the most traditional and luxurious type of wooden flooring. The planks are made from just one solid piece of hardwood. You have the option of sanding and re-finishing your flooring a number of times if and when required. Your solid wood flooring has a long life expectancy, offering a timeless and charismatic appeal. You can find solid wood flooring in a wide variety of species of wood, ranging from light to dark with different patterns and grains. The planks of solid flooring can be found in random lengths and different widths so that you can choose something which suits your surroundings. The tongue and groove fitting system is the more traditional and well established method of installation. You have the choice of either unfinished or pre-finished planks of solid wood flooring. Where do you want to install the flooring? Where you want the flooring to go may help you to decide whether to choose engineered or solid hardwood flooring. Solid wood flooring is great for high traffic areas as it can be sanded down and re-finished multiple times. So if you are looking for flooring for an entrance hallway or living area then solid wood flooring could be a good option. If however, you want hardwood flooring for a room where temperature or humidity is continually fluctuating, we would recommend engineered hardwood. For example, conservatories, rooms with a lot of glazing or even for a kitchen. Engineered hardwood flooring has been designed to withstand slight changes in its surroundings, so can cope with changing air temperature, or moisture in the air. If you are thinking about using underfloor heating with your wooden flooring then you will need to choose engineered hardwood. Engineered hardwood is the perfect match for underfloor heating. It allows the heat to be transferred to the surface of you floor safely. Engineered hardwood can cope with the constant changes in temperature and will react accordingly. It will expand and contract and is dimensionally stable enough not to become damaged by the heat from underneath. We would not recommend using solid wood flooring with underfloor heating. If you have a tight budget for your floor then engineered hardwood usually works out more cost effective than solid. Solid hardwood is generally more costly because of the amount of solid wood that is used for each plank of flooring. Be careful not just to assume that engineered is better value than solid hardwood. Some types of engineered flooring can be quite costly, especially if you choose a rare species of wood, or opt for a very wide plank size. Always be sure to check both options when deciding what is best for you.